At the end of each payroll year (which finishes on June 30), you can use MYOB to supply each employee with a payment summary. A payment summary is a short document that summarises the gross wages, tax and allowances the employee has received during the last 12 months of employment. Click against Gross Payments on the left side and then, on the right side, select all wages categories that are part of your employees’ gross wages. Gross wages includes categories such as Base Hourly, Base Salary, Holiday Pay and Personal/Carer’s Leave. Don’t include any employee allowances at this point. Don’t include any amounts you pay to employees under a salary sacrifice arrangement in Gross Payments. Select any deductions that come off Gross Payments. To report on employee allowances such as tool or uniform allowances, click first against Allowance 1 on the left side and type a short description in the Description column, such as ‘Motor Vehicle’, ‘Uniform’ and so on. Repeat this for each different kind of allowance you pay. Then, for each allowance category listed on the left side, go to the right side and select the payroll category that belongs to it. Go to ato.gov.au for more about lump sum payments if you need to but, essentially, the lump sum boxes are only used if you pay out long service leave related to August 1993 or earlier, or if employees receive back pay that relates to a period more than 12 months ago. If any employees had union fees deducted from their pay, select the Union Fees category on the left, enter the name of the union in the Description column and select the appropriate union fee deduction category on the right. Check PAYG tax is selected. PAYG tax should automatically be correct, but check that this is the case. Click Total Tax Withheld on the left side and then check that PAYG Withholding is clicked on the right side. Did you have any employees who received termination payments during the year and, if so, did these termination payments include payouts for unused RDOs, payment in lieu of notice or redundancy? If so, you probably need to issue an ETP payment summary as well as a regular payment summary for this employee. For more in-depth information about payment summaries and what to do when June 30 rolls around, go to the eBooks section of the Online Store and look for the document Starting a New Payroll Year. If you pay any reportable super to employees — in other words, super over and above the minimum 9.5 per cent — you need to report these amounts on your payment summaries. To do so, when you get to Step Five of printing your payment summaries, click the Link Superannuation Categories button and select all super categories that you have to report, such as Salary Sacrifice super or Employer Additional super. Don’t fall into the trap of reporting all employee super on your payment summaries. The only super you report here is any super over and above the legal minimum. Often when you go to generate payment summaries, you see a whole batch of employees (both new and old), suppliers and subcontractors. Old employees aren’t such a problem, because MYOB doesn’t generate payment summaries for anybody with zero totals, but you don’t really want suppliers and subbies appearing on the final summary document (called an ‘EMPDUPE file’) that you send to the ATO. Suppliers usually appear in the list of payment summaries because they’ve accidentally been set up as an Employee as the Card Type. You can’t change this setting if this supplier has transactions in the system, but you can do a quick fix by going to the supplier’s card, clicking the Payroll Details tab and selecting Other as the Employment Basis. 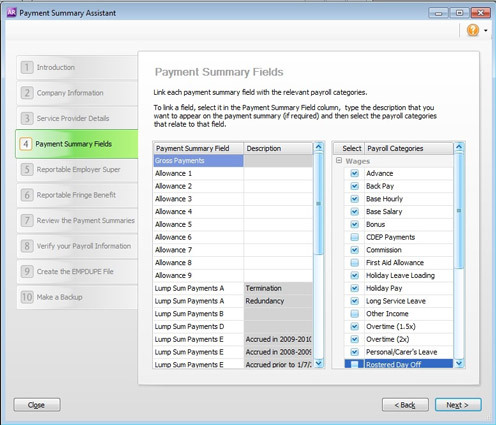 The second-last step of the payment summary process asks you to ‘Create the EMPDUPE File’. When you click the button to create this file, MYOB prompts you to save this file in a folder on your computer (your Payment Summaries folder that sits inside your MYOB program folder is usually an okay bet). If a message pops up saying, ‘This file already exists. Do you want to replace it?’ click Yes if you’re redoing your EMPDUPE file because you made a mistake first time around. On the other hand, if the EMPDUPE file that you’re about to replace belongs to last payroll year, click No and, instead, change the name of your EMPDUPE file to incorporate the year; for example, ‘empdupe2015.ao1’. This ensures you won’t overwrite your file from the previous year. The ATO now requires you lodge this file electronically by logging into its website (you’ll need to register as a business if you haven’t done so already), and then clicking Lodge File from the File Transfer menu.